The following list is neither all-inclusive nor is it meant to serve as an endorsement. A good source of consumer trends informa­tion for business leaders. Business Owner’s Toolkit offers more than 5,000 pages of free cost-cutting tips, step-by-step checklists, real-life case studies, start-up advice and business templates to small business owners and entrepreneurs. The site also offers a monthly newsletter, up-to-date news topics and a column that closely follows industry trends and offers trusted advice. An easy to follow, step-by-step guide with full-color illustrations and screen shots on every page. Very useful if you are browsing the Internet. This Internet forum provides trend information, reports, and other food-industry facts plus online forums, links to other food sites, and a direct link to Food Channel staff. The Food Channel will offer a new publication called FoodWire. It will be targeted to the general public and contain food news, trends and recipes with interactive links to www.foodchannel.com. TrendWire is currently published every two weeks. FoodWire will be published monthly. Both will be free publications (advertising supported). NewHope360 is the premiere digital marketplace that connects the healthy lifestyle industry from supply to shelf. For Suppliers and Manufacturers: we connect you to your next customer, and provide you with the sourcing, market research, standards and legislative information you need to develop a trusted consumer product. For Retailers: we provide the trends, operation tactics, products, and consumer concerns that give you the insight you need to grow your store. For You, the Healthy Lifestyle Enthusiast: we bring you the information on healthy living – from recipes to supplements to sustainability. We support you as someone who cares about your health, the environment, and making conscious choices with your dollars. NewHope360.com is brought to you by New Hope Natural Media, a division of Penton Media, Inc. For more than 25 years, New Hope Natural Media has been the leading media resource and information provider for the natural, organic and healthy-lifestyle products industry. Our publications, events, e-business products and services deliver industry information and provide community-building forums that connect you to your next customer. In print, we offer the best consumer and trade publications, respected for their high quality of content; in person, the largest natural, organic and healthy-lifestyle products trade shows; and online, the leading-edge consumer and trade websites in the natural products industry. 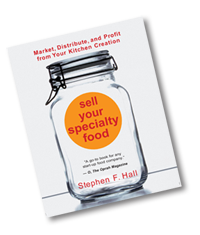 The SFA produces an online specialty food catalog that helps consumers find the products they’re looking for. It does not offer the products directly, but connects the consumer with a search capability more than 200 listings of specialty food companies’ websites. Key industry resources including certifiers, associations and support services can be found on The Organic Pages Online. To learn about acquiring an organic farm or how to start an organic business, see HowToGoOrganic.com. This offers a combination of lifestyle network and web site committed to exploring new and different ways to view food. Deep River Interactive is a wholly owned subsidiary of Swardlick Marketing Group, working with companies and organizations to create new business models based on the transformative power of the Internet. They help businesses reinvent themselves using new technologies and integrated marketing solutions to achieve powerful and measur­able results. An electronic magazine that provides infor­mation on creating and maintaining an online comprehensive newsletter. Offices in Atlanta; Washington, DC; New York; Tucson; and Brussels. From conceptu­alization of strategies and budgets, to imple­mentation and ongoing support, Kellen Interactive is committed to exceeding your expectations. They provide daily services as Webmasters and Internet consultants for over 200 companies and organizations. Kellen offers one-on-one customer service and project management every step of the way. They are committed to client budget, objectives, and deadlines for every project. Build your own website using SnapMonkey’s easy-to-use “Point and Click” technology. Sign up for SnapTo It Tips in a weekly e-mail that shares with you great ideas on promoting your Web site and your business to more people on the Web! This India based company can execute Search Engine Optimization (SEO) and Webdesign and development with over 6 years of experience. Offers a service that helps you build, man­age, and market an online store. This is a free resource developed to help website owners, advertisers, and marketing professionals get the most from their mar­keting activities. The site includes details of the latest Web marketing techniques being used by many of the most successful sites on the Net, and features articles, reviews, and links to hundreds of the best website pro­motion resources available. Go to www.commercialkitchenforrent.com to locate by state commercial kitchens that rent space and equipment. Here is a list of resources that can help you create and implement a website marketing program. This company has been in business and offers online legal services for start up companies. LegalZoom.com helps you create reliable legal documents from your home or office. Simply answer a few questions online and your documents will be prepared within 48 hours. A good source for assistance in setting up incorporations, LLC’s, trademarks and others. This is an easy way for people to search Craigslist.com by state. An online resource center with a wide vari­ety of resources for small businesses. Provides a full resource center full of ideas on how to bring your small business online, and grow it to success. A complete listing of all chambers of commerce in the United States. Provides information and guidelines for small businesses. Provides information on applying for and researching patents and trademarks. Provides web analytics services and website sta­tistics and is the leading provider of web analysis and consumer-centric marketing intelligent solutions. Provides a comprehensive list of associations for trade industries. A listing of over 400 subject specific directories and search engines that accept search engine submissions. An informational site on how to create press releases, and have them distributed to your target market. Search engine marketing and optimization techniques. An incredible resource directory listing all kinds of advice for small businesses. A website for anyone interested in the set-up and operation of a small business. It offers various discussions and blogs covering many topics. This website allows you to order gourmet foods by region, imported and hard to find foods by type, brand name or region. Sales are conducted by online ordering only. With the recent launch of buy direct, this Virtual Farmers’ Market assists growers and crafts-people to sell their products far beyond their geographical confines. farmers and crafts-people with active websites are eligible to advertise their products on the Buy Direct webpage. Free and premium listings are available to promote their products when a reciprocal link to www.OnlyatFarmersMarkets.com is placed on their active website. It takes “local” to a national level. Master baker and chef Detra Denay Davis offers online instruction and how-to establish a thriving home baking business. Cooking with Denay promotes getting back to basics, baking, cooking and sharing homemade products at local farmers markets and food cooperative. The site shows the 24 states and the local laws that allow some form of home based baking and sales either to the general public or at state sponsored farmers markets/co-ops.